The Adventures of Tioga and George: Where's That George Guy? In the vast world of Bloggers, today, that George guy has got to be the very last one out of the gate! But, George has mitigating reasons. Good ones, too! Not just excuses, as you might expect. 1. Our checking account got screwed up. Overdrawn?! Impossible! Not the way George watches that account. Like an eagle, that George watches his checking account! But the checking account got overdrawn! Cash was not transferred from savings to checking in the right amount! Customer service could not address the problem because of a downed computer. After waiting for more than 20-minutes on hold, George decided to phone back later. 2. Cleaning the inside of Scampy somehow got screwed up too! Not done for several days! How could that have happened? Anyway, it's back to clean now. 3. Ordering Tevas. George's Teva Sandals needed replacement badly. Finding a nice looking pair of Tevas took quite a while. It's the color that was the hangup. Finally, after about an hour of looking all over the net, George found his [Here]. After working on making a wood shim for Tránsito's door closer, it was determined that the wood shim was too thick. We are now trying a 1/16" thick steel shim. But that shim is too short. Only 2" long. We need to buy a 4" long shim. So, off to the hardware store we go! The movie "8th Grade" got very good reviews on Rotten Tomatoes. So, I went to see it! The movie is playing at the AMC in Missoula. The first thing that struck me as I went to go thru the theater entrance was the sign on the front door! What the heck is a Dine-In Menu? Then when going to buy my movie ticket, I was handed a menu and informed that all of this food on the menu is ordered from my theater seat! Imagine that? The theater seat is like nothing I have seen before in a movie theater. It's electrically controlled to adjust in several directions! My waitress/usher is a young woman who handed me a several page menu. 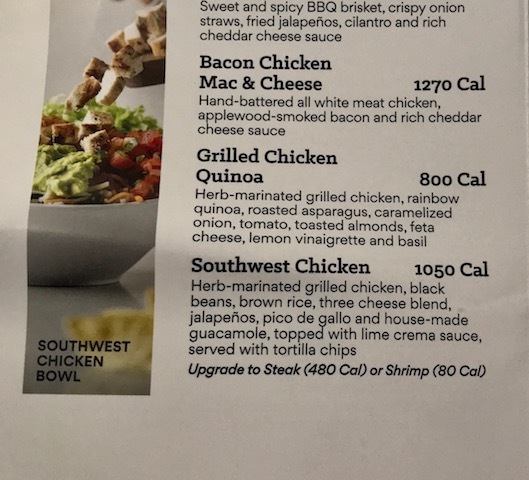 So, what's it like eating Southwest Chicken in the very low light of a movie theater? Well, first of all, it isn't possible to see the food clearly enough to know the difference between a chicken chunk and a hot chili pepper!! I forked a hot chili into my mouth and blew my brains out! I gulped my freestyle Coke to cool my burning mouth. Very soon, all my coke was gone and my mouth was still burning like crazy! Hitting the button in order to call my waitress did not bring a prompt reply. So I went out to the theater hallway looking for a drinking fountain and found the fountain in the lobby. I gulped the water. And slowly the burning in my mouth went down. Lord! 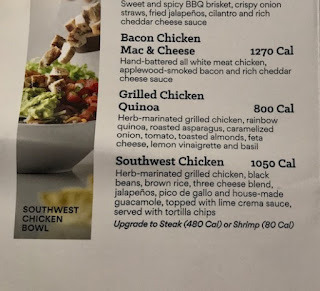 This is my chicken bowl when I stopped eating. Popcorn is fine for a movie theater. You just stick your hand in the popcorn bag, find a popcorn kernel and put it in your mouth using your hand. 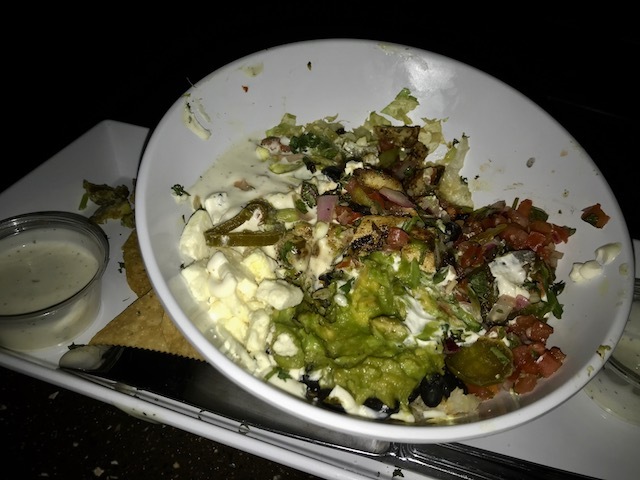 A fork doesn't work for me in a darkened theater! I watch my account like a hawk too. Years ago someone hacked my account and withdrew all the money. All my check for bills bounced. I called the bank and they said large amounts were withdrawn from somewhere in Texas. The bank put money in my account and reversed all the overdrawn and late charges. then they went looking for whoever messed with the banking system and my account!! There is a whole lot of rotten lawlessness going on in recent years. Somebody made a go of changing my address in my Experian credit report. My bank caught that change and contacted me to see if the address change was my doing. It wasn't! After that incident, I signed up with Identity Guard! This service is not only for identity theft. It also catches attempts to get at your credit cards and bank accounts. In my opinion, Identity Guard is invaluable! Click [Here] to go to the Identity Guard site. ... just way too much to digest in one blog read. I think you are just entering your prime! Btw, I joined your 80 club on Aug 1. My kids gave me a T-shirt: 80 is the new 60. I told them about you... I think you now may have at least 2 more fans. You continue to be an inspiration to me. Have fun! Teva sandals are supposedly the #1 sandal worldwide! Yes, Tevas are a bit pricey. However, Tevas last and last! Great quality. My old Tevas are still good.But I am buying new Tevas for the color. A lovely blue pattern! BTW, my new Tevas cost me $50. No shipping charge. And I bought my Tevas directly from the Teva factory. I am guessing that your $20 Wal-Mart sandals are not Tevas. Am I right? "You continue to be an inspiration to me." I have a teva clogs...lavender color. Good in rain or shine and I love them. Had them or years, and years. Wear wool sock with them in winter, and no socks in summer...awesome! Not good for hiking tho. Yes, Tevas are not good for hiking. Or, any other place where there are small pebbles! I still can't believe that you blew your brains out!!! You really should not believe that I myself blew my brains out. I did not do that! If you ever need to cool off your mouth again after eating hot peppers get milk. Will work better and faster than water. In this movie situation however, milk may not be available.